Today was the climax of 3 months work coaching a team through a Lean RCM Masterclass in Lean Reliability Centred Maintenance. It was review day! This is the day where the team showcase all their hard work for the senior team. Daunting, folks who would never dream of presenting stand up and explain how they have made a difference to their processes, a great display of ownership. Today’s highlight: whilst explaining why the tasks had been written one of the team started to explain in his words the P F-interval. Demonstrating a great understanding of the new skill he had learnt. What is the P F-interval? This is the science behind how we schedule on condition tasks to prevent failures. The P F-interval is the period of time between starting to fail i.e. 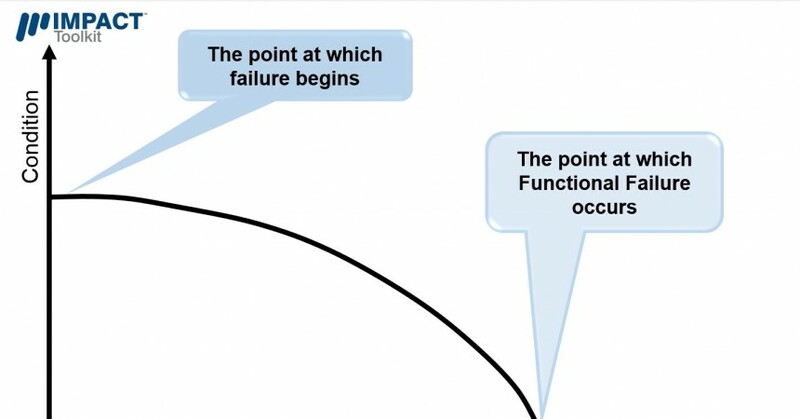 from good condition, to the point at which final functional failure happens i.e. the equipment stops functioning to the required standard. The length of this P F-interval is determined by the technique that you use to detect failure: the more sensitive the technique the longer the P F-interval will be. The frequency of inspection has to be less than the P F-interval to prevent failures and the general rule of thumb is that the frequency of inspection should be half of the P F-interval this ensures that there is a sufficient amount of time remaining to take action before the final functional failure occurs. 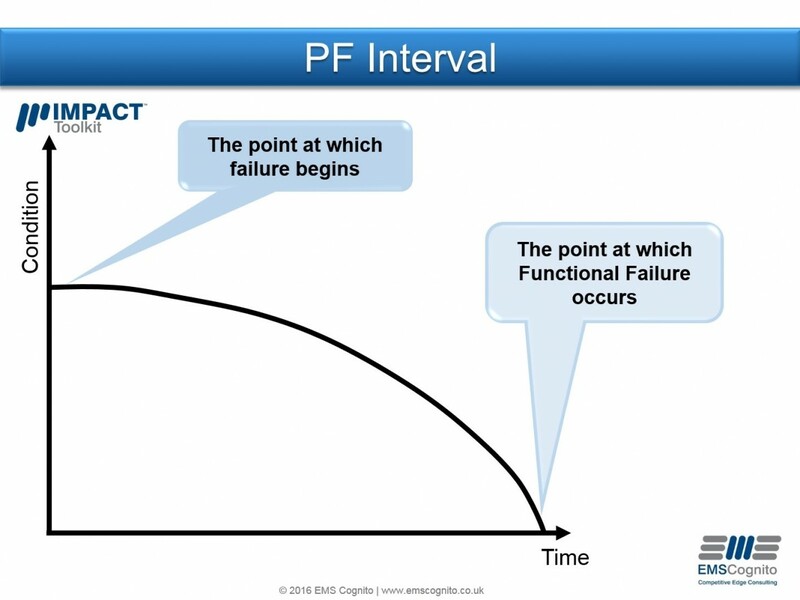 For randomly occurring failures, as it is not possible to determine when the failure development period will begin, the scheduled on condition task has to be done at a frequency less than the P F-interval throughout the working life of the component. But beware, don’t confuse the length of time a component has been in service before it fails with the entirely different concept of once it starts to fail how long does it take for the deterioration process to occur. Take failure of a bearing due to water ingress as an example. The bearing may have been in service for five years before the grease is contaminated due to water. Once the water contaminates the grease it will be a matter of weeks before the bearing fails. The PF interval is the number of weeks it takes from the water entering the grease until the bearing collapses and not the prior five years. After all, the water could have entered the grease at any point in its working life. With age related failures, it may be possible to set a trigger point to commence the on condition tasks i.e. to make a judgement that failure of a car tyre due to lack of tread will not occur until at least 15,000 miles and therefore only start inspecting for tread where after this point. The P F-interval is often misunderstood and I often hear managers saying to teams, ‘since you are in the area can you add this to the task?’, every time we ask this we devalue the task and risk adding waste into the process. Do all your preventative tasks add value or are you asking your team to complete tasks that will not prevent the breakdown of the machine? 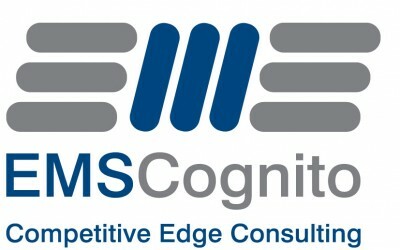 Why should an organisation have O.G.S.M? Does it Matter and do you know?